Published: Jan. 29, 2013 at 11:04 a.m.
Running backs have almost always been considered the lifeblood of fantasy football (up until recently, that is), but a select few have found immense statistical success in the Super Bowl. In fact, only seven backs have won the MVP honor in 45 championships, and 16 runners have rushed for 100-plus yards. In the second part of our three-part series that combines Super Bowl success and fantasy football, we'll look at the top 10 running back performances in the ultimate sports championship. Despite the effects of a migraine headache in the first quarter, Davis was able to put the Broncos on his shoulders and lead them to a 31-24 win over the Green Bay Packers. He rushed for 157 yards with a Super Bowl record three touchdowns and scored 34.5 fantasy points, the most of any player at his position. Davis was awarded MVP honors. 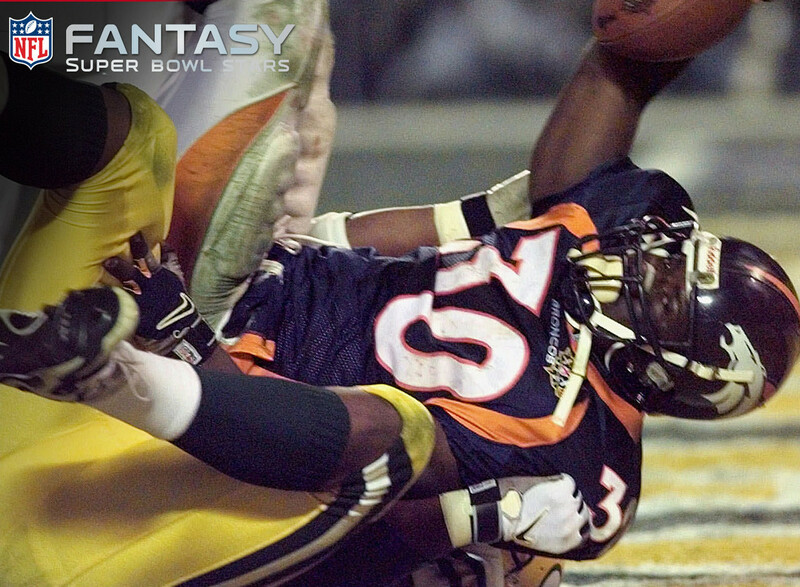 Smith came out of nowhere to rush for a Super Bowl record 204 yards and two touchdowns a 42-10 win over the Broncos. Smith's two scores came on runs of 58 and 4 yards and were part of his 33.3-fantasy point performance. His success would not be a window into the future, though, as he rushed for just 476 yards during the rest of his career. Allen led the Raiders to their third title in club history with what was a Super Bowl-record 191 rushing yards and two touchdowns in a 38-9 win over the Washington Redskins. The most memorable moment of the game was Allen's amazing 74-yard run in the third quarter that put his team ahead 35-6. He would finish with 32.9 fantasy points. Craig was a prominent contributor in the Niners' 38-16 win over the Miami Dolphins. He rushed for 58 yards, caught a team-high seven passes for 77 yards and found the end zone three times for a total of 31.5 fantasy points. Craig's three scores set a Super Bowl record --he found the end zone on a 2-yard run and on catches of eight and 16 yards. While it was Steve Young who was the hero of the 49ers' 49-26 win over the San Diego Chargers, Watters produced a solid stat line. He rushed for 47 yards, caught three passes for 61 yards, tied a Super Bowl record with three touchdowns and scored 28.8 fantasy points. His touchdowns came on a run of nine yards and catches of 51 and eight yards. The NFL's all-time leading rusher, Smith posted 132 yards and two touchdowns in a 30-13 win over the Buffalo Bills - 92 of those yards and both scores came in the second half. Smith, who hit pay dirt on runs of 15 yards and 1 yard, totaled 27.8 fantasy points and earned MVP honors. The win was Dallas' second consecutive in the Super Bowl. In the oldest performance in our top 10, Csonka rushed for what was then a record 145 yards and scored two touchdowns in a 24-7 win over the Minnesota Vikings. Csonka, who earned MVP honors, scored on runs of 5 and 2 yards and finished with 26.5 fantasy points. With the win, the Dolphins became the second team to win back-to-back Super Bowl titles. This Super Bowl will be remembered for how it ended, as Rams linebacker Mike Jones tackled Titans wide receiver Kevin Dyson at the 1-yard line just as time expired to preserve a 23-16 win. George was very productive, rushing for 95 yards, catching two passes for 35 yards, and scoring twice in the contest. He would finish with 25 fantasy points. In a game that will forever be remembered for Scott Norwood's failed 47-yard field goal attempt, Thomas' performance was a bit overshadowed. He posted 190 scrimmage yards, scored on a 31-yard run and finished with 25 fantasy points in a 20-19 loss to the New York Giants. Shockingly, the Bills had the football for a mere 19:27 minutes in the game. Riggins led the Skins to a 27-17 win over the Dolphins for the franchise's first Super Bowl title, and first NFL championship since 1942. He carried the football a record 38 times for what was a record 166 yards and scored on a 43-yard run to finish with 24.1 fantasy points. It was Riggins' fourth straight 100-yard rushing game in the playoffs.